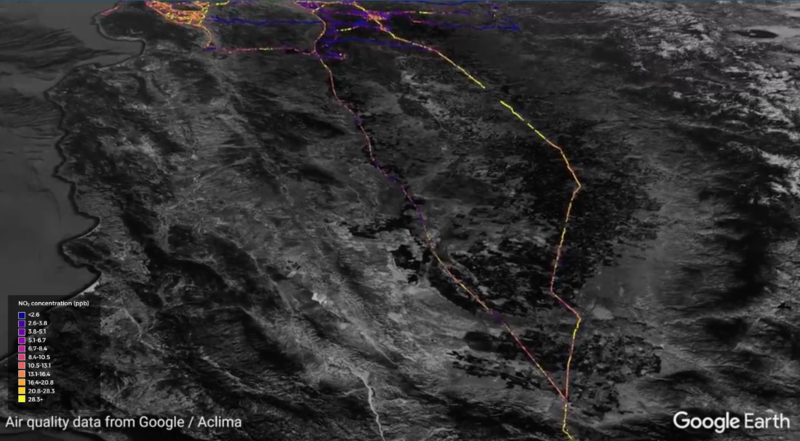 A screenshot from a Google released video showing the company's data on Nitrogen Dioxide pollution in the San Joaquin Valley along Highway 99 and Interstate 5. An online tool from tech giant Google is giving California residents a new look at ground level air pollution in their neighborhoods. The company announced this week new air pollution data collected by its fleet of Google Street View cars. The mapping took place in Los Angeles, San Francisco, and the San Joaquin Valley. The company has several produced data visualizations based on Nitrogen Dioxide (NO2) pollution levels. Together with technology partner Aclima, Google says it plans to offer the data to scientists. The company says its fleet of Street View cars logged over one billion air quality data points while driving over 100,000 miles equipped with Aclima's air quality sensor technology. In the San Joaquin Valley, the routes covered include Highway 99, Interstate 5, and detailed coverage of north valley communities including Merced, Turlock and Modesto.